With 12 runners at the start line waiting to run the Frome Half Marathon, 10km or 5km races, it was always going to be a good day for Positive Action on Cancer, but no one had predicted quite what a big day it was going to be! PAC dominated the top 10 for the Half Marathon with three runners coming in at under 1hr 30min. Luke Scott, who ran as part of a corporate team from Mulberry, came in 4th with his team mate Luke Tucker not far behind in 9th. Jim Plunket-Cole, a dedicated PAC supporter sprinted over the finish line in 10th place. But it wasn’t just the top positions that made PAC stand out from the crowd. Last to finish the challenge was husband and wife team Kyle and Jemma from Little Urchins in Warminster, who crossed the line, in the sweltering heat after 3hrs and 11 mins. Jemma and Kyle Stickley made the local charity beam with pride as they picked up their pace and ran across the finish line, still smiling despite the race organisers having packed up the route in front of them, meaning they had taken a wrong turn and added an extra mile to their challenge. There was no persuading the duo to accept a ride on the sweeper bus picking up runners who couldn’t complete the challenge, and their determination to finish the race for the charity was phenomenal to watch. Fundraising and communications manager at PAC, Hannah Culff said, “It was a really emotional moment when we watched Jemma and Kyle run towards the finish line. It was a huge challenge for both of them, as neither run regularly and we cannot thank them enough for their support. 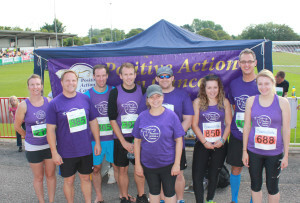 Positive Action on Cancer is a local, Frome based organisation who deliver life-changing support for people affected by cancer and other life threatening illnesses. PAC provides free professional counselling support for cancer patients and their families through what can be the most challenging time in their life. PAC’s clients say that the service, the only one of its kind in Somerset, West Wiltshire and Bath, provides a lifeline through their darkest days. To find out more about PAC or to sign up for a challenge event go to www.positiveactiononcancer.co.uk or contact Karen Dufton on info@positiveactiononcancer.co.uk.